Conversely, television loves the ratings Trump provides way too much to ever tune him out -- or even refuse just one of his impulsive call-ins. Donald’s on the line. Drop everything immediately before he hangs up and goes elsewhere. 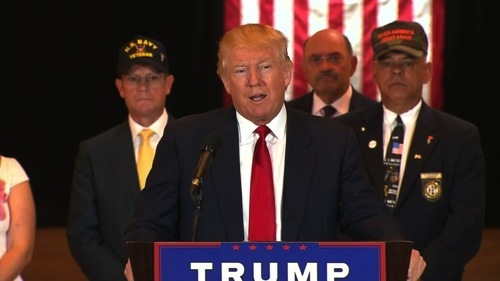 It all crystallized Tuesday during Trump’s extended defense of his trumpeted and belated donations to veterans after he skipped a January debate on the then “unfair” Fox News Channel and held his own competing event on behalf of those who served. He’s assailed the media before. In fact it’s a news bulletin when he doesn’t. But during Tuesday’s presentation, which included another lengthy Q and A session, the presumptive Republican presidential nominee repeatedly and pointedly bombed away while a handful of veterans stood soberly behind him. Even for Trump, this was the mother of all air attacks -- by a guy who literally lives to be on television. CNN, Fox News Channel and MSNBC of course all covered it live from start to stop -- and then spent the rest of the day and night analyzing their treatment at Trump’s hands. No matter what he says or does, the bombastic billionaire continues to earn points for making himself available while his principal opponent, Hillary Clinton, stiff-arms the media and would rather call Trump Lincoln-esque than hold a news conference. One of the more telling visuals of Showtime’s campaign trail series, The Circus, came when co-host Mark McKinnon was left out in Iowa’s snowy cold and required to stand at a long distance from Hillary as she exited a campaign event. She would sooner provide access to Ebola. Or at least sometimes it seems that way. If Trump loves/hates the media, Hillary flat out hates/hates it, according to a new and lengthy profile in New York Magazine by Rebecca Traister. She has her reasons, the article points out. But the ravenous feed-the-media-beast realities of Campaign 2016 (as always, the hand-wringing will commence well after the fact) have made Trump a Beastmaster without peer. The guy fully knows what he’s doing -- even when he doesn’t. And Tuesday’s extended exhale in the media’s face helped to take the edge off those same-day Trump University court documents that provided further evidence of his con man ways and means. Some in the electronic media -- most notably CNN’s Jake Tapper -- lately have made it a point to blast through the Trump rhetoric and shine his glaring inconsistencies in his face. Trump in turn brands them “nasty” or “dishonest” or “a sleaze” during a Tuesday broadside aimed at ABC reporter Tom Llamas. Some of those gathered to hear Trump’s latest fusillade tried to fight back by telling the candidate it’s their job to scrutinize his campaign. He responded by basically telling them they’re gonna take it and like it. Because he is who he is -- and America’s with him, not them. On that January night when Trump spurned Fox News Channel’s debate and held his own event, the network drew 12.5 million viewers compared to the 25 million for its inaugural GOP debate in August. That was the one in which questioner Megyn Kelly rumpled Trump by reciting some of his previous coarse descriptions of women. It’s easy to see who eventually won that one. Trump snubbed the second debate because of Kelly’s presence, and then bragged about FNC’s ratings shortfall. Kelly subsequently made what amounted to a Game of Thrones-like Walk of Atonement to Trump Tower, where she persuaded him to be the much-trumpeted featured guest on her recent first Fox broadcast network special, Megyn Kelly Presents. Trump otherwise isn’t one to sit and wait. He forces the action and basks in its glow while also letting the media ask him anything they want -- if they dare. He’s certainly no Hillary in that respect. And if anything, that still seems to be working against her.